The hurricane hunters have been out into 93L this afternoon, and confirmed a closed center with a minimum pressure between 1007 and 1008 mb. IR Satellite imagery has illuminated with moderate to deep convection especially on the eastern side. This convection [should] wrap around on the northern and western side. The hurricane hunters found winds of 45 mph…with a major caveat. That is the first of two major caveats to what is written below. 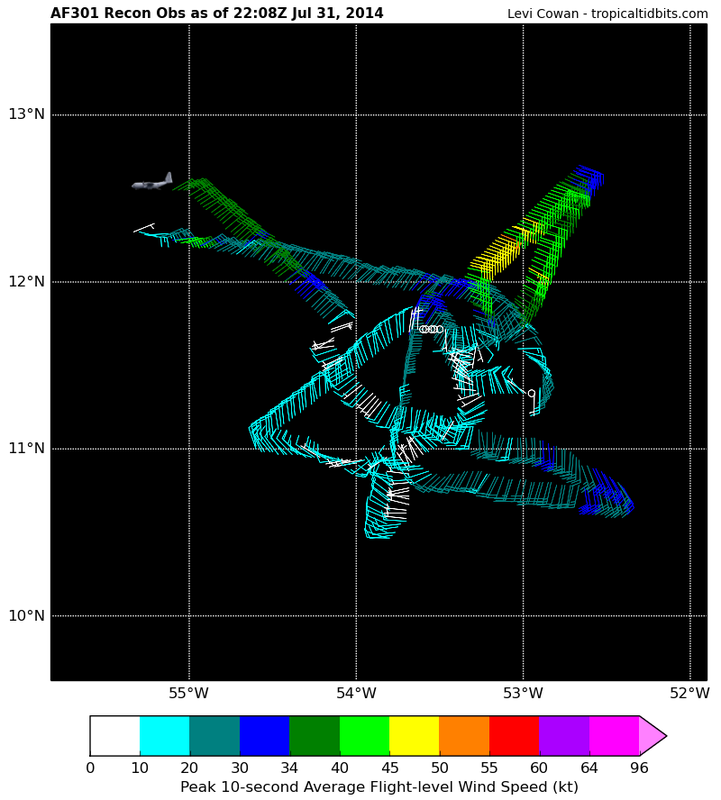 Hurricane Hunter path and wind speed within 93L this afternoon. Notice where the highest winds are in 93L. Usually in a tropical cyclone you would see the highest winds in the front right quadrant, and that is what happened today with the highest winds on the northeast to northern side. BUT! Those winds may have not occurred due to 93L, and there is some suspicion that those winds are due to the wind burst that came from Africa with the drier air that has plagued. It is well known that winds that far north are faster. Even acknowledging that reasoning, winds have been estimated at around 40 kts or 45 mph. The second caveat for 93L is that it is now getting close to 300 miles from Barbados. That is close enough to begin to wonder if maritime and land warnings are necessary for a quasi-tropical storm. Even though it may not completely meet the persistent convection requirement, its organization has been strong much of the last few days. Given the latest guidance from the NHC at 45 mph, the potential human impacts, and the red tape in needed for warnings…this is a tropical storm. The NHC has followed suit by upgrading to Tropical Storm Bertha. As always, consult the NHC for official information! Through the Lesser Antilles. Tomorrow evening, this system will be moving through the central islands somewhere between Barbados and Dominica given the current forecast track models. Those islands can expect a day or so of on and off thunderstorm activity with winds up to 50 mph and heavy rain. These squalls may occur on the backside of the low pressure system whether it be a tropical cyclone or not. Moderate shear, decent water temperatures, and persistent dry air will stay with this system. The intensity forecasts pick up on that so far with basically a flat line in any intensification. NHC generally agrees. Shear for a time may actually increase in the Caribbean from the west. In the midterm however, we start to see an outflow channel develop to the north when the system gets into the Bahamas. By that time, water temperatures gain steam…pardon the pun. I don’t think we see ample intensification until after the Caribbean. That is as long as this system does not run aground in the tropical graveyard that is Hispaniola, which a considerable amount of models are now showing as well as the NHC. 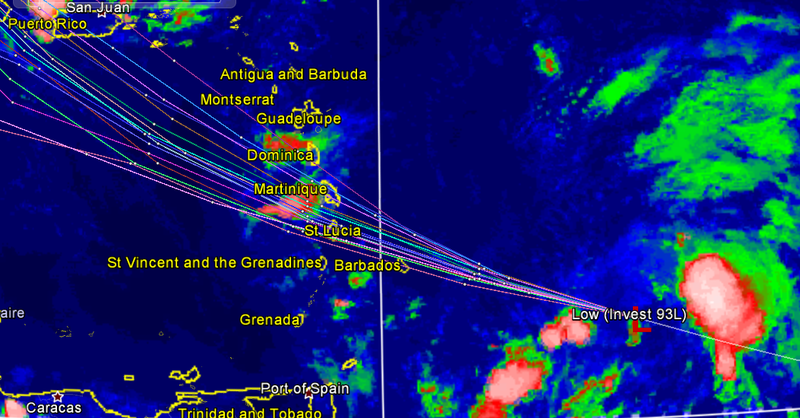 Systems in the Caribbean tend to drift more westward than the models show…so we’ll see. Saturday and Sunday will likely be rainy in the eastern Greater Antilles regardless of formation. Posted on Thursday, July 31st, 2014, in Tropical Weather. Bookmark the permalink. Leave a comment.